I was reminded tonight of why I love movies. I sat in a dark room with mostly strangers, and some great friends, and my child, and we were all transported, transformed, transfixed. It is simply transcendent. Star Wars is the reason I became a cinephile at a young age. The epic story telling, the myth making, the movie magic. I was hooked early and I've never looked back. The Last Jedi brought all of that home for me. The Last Jedi had me on the edge of my seat the whole time. Despite the formula, despite the film being an homage to The Empire Strikes Back in countless ways, the film kept going in different directions that I could guess. I never once felt secure that a character might not be killed, that a plan might not work out. The Last Jedi is an exercise in pulling the wool out from under us and making us take notice. This is story telling of the caliber that our ancestors managed sitting around the fire, the very human legacy of narrative which sets out who we are. On the one hand it is hard to pick favorites in this sprawling cast who are all remarkable. 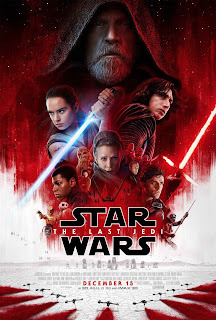 From the surprisingly impactful presence of Benicio Del Toro and Laura Dern, to the cannonball arrival of newcomer Kelly Marie Tran, to the continued amazing screen capabilities of John Boyega, Oscar Isaac, Adam Driver, and of coarse Daisy Ridley, to the rest of this amazing troupe, not to leave out the chameleon that is Andy Sirkis. But on the other hand this is all about Mark Hamill and of coarse Carrie Fisher. Fisher is stunning in her final role. Leia is the centrepiece of this film and she holds that place with a true gravitas. I know many will cry at this performance. Admittedly, The Last Jedi is a more challenging film than most blockbusters. It deals with issues of loss, death, failure, learning from mistakes, and multilayered identities. Mainstream audiences have often rejected complicated tentpole films, preferring their action to be more straight up. Jedi doesn't let you get away with that. It is clearly for a more discerning taste. This is a golden era for kids of the 80s like me who are seeing their passions come to such rich life. Star Wars taught me what it means to love movies and tonight I was not only reminded but freshly reinitiated into the cult of film.